This company is waiting for the owner, Dr. Cohen to complete his exam in professional practices in clinical psychology. Dr. Cohen is license eligible and has completed over 3,000 of supervised and paid work in the field of clinical psychology. His next task is to take 2 tests in order to be licensed. Therapeutic Advertising tm is designed to promote educational material and supplies that help educate the public and providers on how to use mental health services. Please contact him at drjoshcohen@filmandvideobasedtherapy.com in order to place an ad on his blog in exchange for an equal value. you may win a chance to get a free copy of Video and Filmmaking as Psychotherapy:Research and Practice on paperback during the lecture. 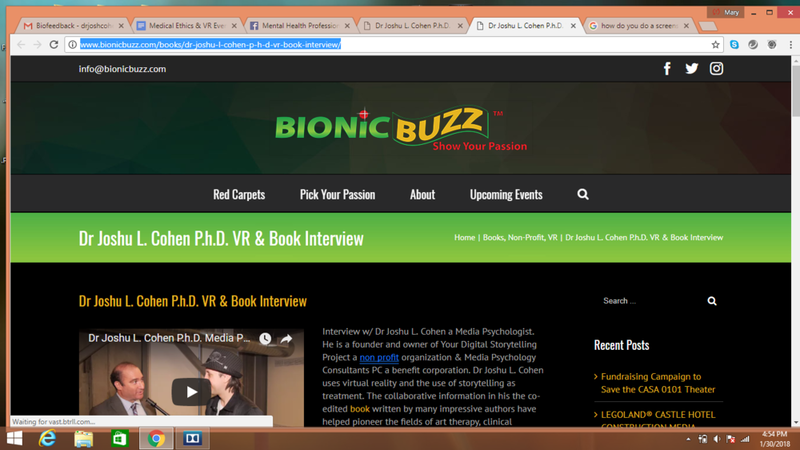 If you are interested in investing, please email Dr. Cohen at drjoshcohen@filmandvideobasedtherapy.com about his benefit corporation Media Psychology Consultants P.C. If you would like Dr. Cohen to do a special and specific personalized commercial for your company. The distribution package is part of his book which is in the national library of medicine, and in over 60 libraries including the Hong Kong library in China. Please call 213-864-4375 and or 213-267-2416 (voice) to get a free consultation and at least one month free to establish value. To change oneself so one can have a ripple effect on the world using technology for human purposes in concert with nature. These images are protected by copyright by the original owners and since this is being used for educational purposes and not for profit, it may fall under the category of education which is protected under the library of congress for educational purposes. Your Digital Storytelling Project is a non profit in progress and is listed in the city of Long Beach as an educational facility and does not provide psychological services. This video was made for the bachelor's thesis for Dr. Cohen's work as an undergraduate in Anthropology and film:the production of contemporary myth which was a self made major combining work from the Anthropology department and the English department and Tomm Sanny's film program. The paper vr version of the thesis "Catharsis-Film healing-collaborative art therapy" Is also in the library of congress to document the record and in the Colorado College library where the VHS copy rests today in special collections. Andrew Mudge and Marc Webb also emerged from this program but Neal Baer and Doug Pray worked on projects well before then. Dana Stevens was introduced to me while still in High School before she went on to write other incredible screenplays. To see a full list of the accomplishments of these talented individuals, please watch the credits at the end. Catharsis, before Freud's time, meant to heal the audience through a symbolic tragedy, not literal, fictional... like the Oedipus myth. Other myths, which Freud adopted based on Fraiser's mythology, cultural anthropology, and pioneers such as Carl Jung, Mircea Eliadae, and Joseph Campbell developed which contributed to our cultural understanding of civilization as well as the talking cure. Francis Ford Coppola also drew on Frazier's mythology when doing some of his later work including the mythology of Mircea Eliadae for a recent film. Brandon Brawner, who is a licensed psychologist, not in this film but in Dr. Cohen's PhD dissertation, also worked with Coppola on Apocolypse now and left the field to become a dramatherapist and pioneered work in video therapy and worked with adolescents and the prison polulation. Others like Brian Austin, Lauren Johnson, John Ehinger, Amanda Pike, Peny Orr, and many others contributed to Dr. Cohen's PhD dissertaion and his focus on making the vision of using films as therapy, a reality. Judy Weiser can be credited for pointing out that many people in Italy had been doing this kind of work years ago and also Lauren Johnson pointed out, in her pilot study, that this kind of work was also used in group homes in the 40's , similar to what Brawner did. Lauren, also did work in Canada that won her the best dissertation award for her honest self reflection on being a single mother and using therapeutic filmmaking to show hope and mastery. Others like Josh Flanders used film for work with the deaf. Neal Baer is a licensed pediatrician known for his work with George Clooney on ER and his work as an executive producer on Law and Order Special Victims Unit, A gifted Man, and Under the Dome. He pointed out that ER allowed people to ask questions about medicine that they would then take to their doctor. ER is educational and provided real medical information at times but was not a medical service. Others in this film like the people from Concord, where James Cameron got his start, to Doug Pray who worked on the film about the Dalai Lama, with me in 2001, Scratch, Hype, Red Diaper baby, Surfwise, Big Rig, Infamy, etc is also known for his work with Sundance and his work showing how movies can be used for social good with his project with co-producer of Hype and Colorado College graduate as well, Pete Vogt, http://wildmindfilmcamp.com. For three summers (2012-13-14), filmmakers Doug Pray and Peter J. Vogt, in association with Northwest Film Forum, created and ran Wild Mind Film Camp, an 11-day intensive master class for documentary filmmaking in the Washington Cascades. Please note that Wild Mind will not be held in 2017 (no applications will be accepted until further notice). If you'd like us to alert you when we resume Wild Mind Film Camp or offer other programs or seminars, we will add you to our emailing list at: info@wildmindfilmcamp.com. Doug Pray directed the following video produced by Joel Kurahawa, with the camera provide by Tim Smith from Canon and Karen Grosso, an actress working with the Ronald McDonald House. This video is in my last book which I co edited with J. Lauren Johnson and Penelope P. Orr and is in the National Library of Medicine, Hong Kong's Library, and many other academic institutions throughout the world. I also want to acknowledge Dr. Gary Solomon, who is a psychotherapist who was prescribing movies, at the time, from his practice in Portland Oregon. Dr.Solomon was a licensed clinical social worker and now teaches in Henderson Nevada. In 1997, I got some grants from Colorado College and flew him out to the school for a seminar to discuss the important issues facing the vision I had of using filmmaking as therapy. Unfortunately, the seminar was incomplete which prompted me to do the documentary Cathartsis for my thesis and to address ethical issues with movement therapists like Peggy Berg from Naropa, Film professors like Barry Sarchett and John Simons (who taught Neal Baer) Tom Sanny who was a filmmaking professor at Colorado College, and Greg Alba from Victory Outreaach ministeries who put on plays that depicted the lifestyle of the gang member in a drama (or in some cases movies like the film Duke of Earl on TBN) which allows a symbolic and non violent way of gang intervention through the church. Colorado Springs is the center of many christian right groups like focus on the family. I worked for a market research company called Brewer Research, addressed in this film, to talk about what might be appropriate for advertising for each population. The Public VR Lab is a collaborative effort to facilitate a public dialogue and projects around new VR-related technologies; to support the community creation of 360, virtual and augmented content, provide access to tools and headsets; and to generate socially-relevant and locally-focused public interest VR experiences. Brookline Interactive Group (BIG) and Northampton Community Television (NCTV) launched this VR accessibility and literacy initiative at their community media centers in Northampton and Brookline, MA, beginning in Spring of 2016. In this short video, BIG’s Executive Director, Kathy Bisbee, who co-founded the Public VR Lab with NCTV’s Executive Director, Al Williams, shares the vision of the Lab’s work to bring the public access to VR/AR, local content creation, expertise and public trainings through several initiatives. A group of troubled youth from a correctional facility go on a journey that exposes them to various examples of peace in action to see if and how the kids transform. To offer a wide array of peacebuilding experiences to troubled youth that will build peace within and instill a sense of service to build peace in their community and world. In dealing with at risk youth, trauma is usually the root cause of their suffering. What causes trauma, is not the event, but when a person feels disconnected with their body and feelings. When one is hurting, anger, negative behavior, and acting out can result. This can cause someone to create horrible acts that may want to harm the self or others. One needs to get back in touch with their emotions and find a place in their community where they belong. To help that person, one can use art, technology, even mediums like film and virtual reality to heal through therapeutic relationships that help regulate the body, mind, and spirit to be in harmony with the environment. By making mistakes in the virtual world, one can hopefully learn ways of preventing mistakes in the REAL world. By making better decisions, they can hopefully have a positive ripple effect on the world. 8) Preventing mental health care problems before they can begin (preventative medicine) Can Virtual Reality be used to prevent triggers of trauma and mental illness? We do not provide psychological services, only referrals to licensed professionals. If you, or someone you know is in crisis or needs immediate medical attention, please dial 911 or visit your nearest emergency room. This is an educational service and we only provide information, what you chose to do with it is up to your judgement but we strongly suggest you consult with a licensed professional in healthcare who can assist you in making any medical decisions before acting on anything. If you choose to act on this information, please consider the public consequences as well as your own needs and please take care of yourself.